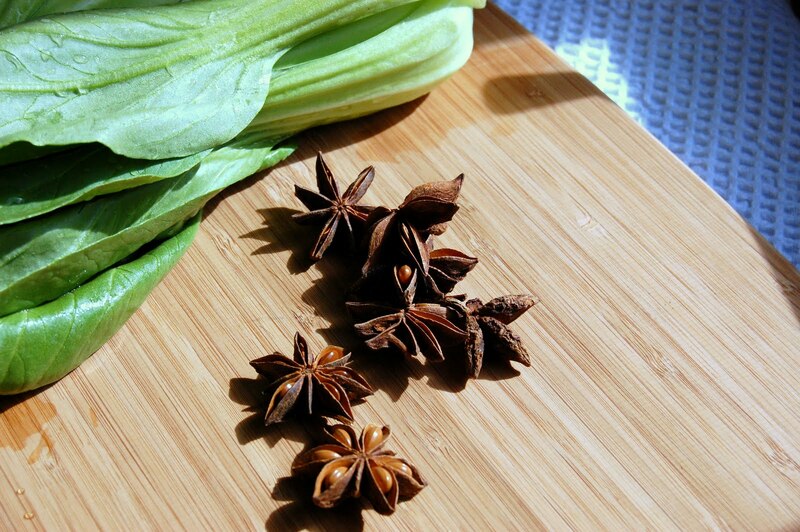 Whole star anise plays a key role in slow-cooked Chinese dishes. The licorice aroma may smell strong, but the wonderful flavor subtly enhances the meat and broth. I found them in the bulk shelf in the spice aisle at my local supermarket. A handful cost only 19¢. In a large, enameled cast iron pot or stock pot, heat oil on high heat. Add beef; stir to sear all sides, about 3-4 minutes. Add soy sauce, wine, sugar, tomato wedges, ginger and anise. Cover and bring to boil; reduce to simmer for 1 hour. If any foam accumulates while simmering, skim off with a small spoon and discard. Add water, cover and return to a boil, then reduce to simmer for 30-40 more minutes, or until meat is fork tender. Discard star anise and ginger. Remove from heat. To cook vegetables and noodles, bring 5 quarts water to boil in a large pot. When water boils, add bok choy; cook for one minute, then remove and set aside (do not drain water from pot). Add noodles to same pot of water and cook until done (about 5 minutes; do not overcook). Drain noodles in a colander. For each portion, place 3-4 ounces of cooked noodles (about 2 cups) into a large soup bowl. Add approximately one head of cooked baby bok choy. Ladle 1 ½ cups of beef soup and beef pieces into bowl, serve immediately. For spicier palates, add Sriracha Hot Chili Sauce to taste. *Note: do not substitute a ‘beef stew’ meat for this recipe. Beef chuck has the perfect amount of fat content to remain tender and flavorful. Beef stew meat will become too dry. Mom traditionally uses beef shank, which has a lot more fat and tendons (a Chinese delicacy for some, but usually a less desirable cut of meat for most). I have adapted to appeal to the masses. oh yum! I can't wait to try this. I know my whole family will love it. Mary, thank you so much for posting your mother's recipes. I cannot get enough of the wonderful recipes and the stories behind them. Please keep posting! More great ideas from the "Amazing Mary Foster"....making this for Gina tonight. She's sooo tired of "dad food". Thanks for posting. Dragon Lady: made this last night and it was very successful, so thank you! Even though I used the low sodium soy sauce, we did not need to add any salt. Also had to let the bok choy go about two minutes instead of your one minute recommendation. Maybe since they were "bigger" baby bok choy. When do we get the "dragonlady" smart phone app?